Explore enchanting Greek islands as well as archaeological sites in Athens, Epidaurus, and Mycenae during this exceptional Aegean odyssey voyage. Definitely a wonderful "trip of a lifetime". We enjoyed so many historical sites and great accommodations throughout. Trips abroad [can be] expensive, but this one was really a great value. 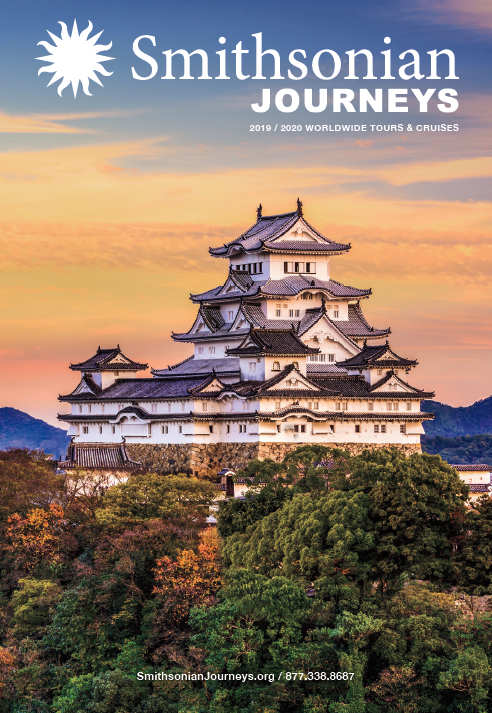 Save $1,000 per person* on our 2019 departures when you book by June 22, 2019! Discover the gems of the Greek islands on this exceptional Aegean odyssey. You’ll explore the cradle of Western civilization and the Classical world and see important World Heritage sites when the weather is mild and sites are less crowded. Meteora: An extraordinary enigma of Orthodox monasteries, this breathtaking World Heritage site seems almost suspended in air due to its location perched atop sandstone pillars. Visit an active monastery where early Christian traditions have continued uninterrupted for hundreds of years. Delos and Mykonos: Mystical birthplace of Apollo and Artemis, Delos is a paramount religious sanctuary of the ancient Greek world. Walking along the Sacred Way to the Sanctuary of Apollo, you’ll see an archaeological site with early temples, a theater, and the legendary Terrace of the Lions. Enjoy an afternoon at leisure to explore nearby Mykonos, which epitomizes the beauty of the Greek Isles. Pátmos: Visit the Greek Orthodox Monastery of St. John, built in 1088 and still inhabited by monks who preserve it as a place of religious study. Rhodes: In Rhodes Town, a World Heritage site, trace the history of the Knights of St. John who erected the 14th-century Palace of the Grand Masters. Also, travel to Lindos for some time at leisure or ascend the stairs to the clifftop acropolis for breathtaking views. Santorini: Be on deck to enter the spectacular harbor of Santorini, a natural caldera. Tour the phenomenal Bronze-age ruins of Akrotiri, recently reopened to visitors, where streets reveal the sophisticated culture of its Minoan inhabitants. You’ll also see the treasures of the Museum of Prehistoric Thera in Fira. 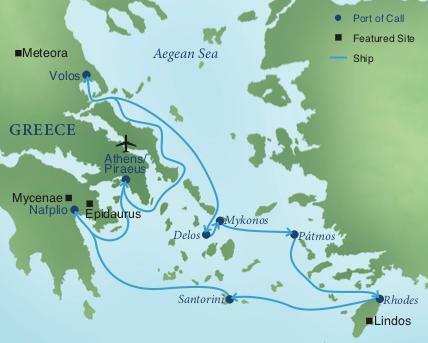 Mycenae and Epidaurus: Sail to the Peloponnese, known for its treasured antiquities and World Heritage sites. Here, you’ll visit the ancient citadel of Mycenae, the classical stage of Homer’s The Iliad. Continue to Epidaurus and its Sanctuary of Asklepios, a masterpiece of classical Greek architecture with its 14,000-seat theater known for nearly perfect acoustics. Cultural Traditions: Meet local residents who discuss contemporary life on these ancient islands. Le Bougainville: Launched in 2019, Le Bougainville is among a new fleet of luxury expedition ships launched by the Ponant cruise line. This ship combines revolutionary design and a new standard of luxury. See more information about this ship on the Tour Details page. Each voyage will also host other leading cultural and educational institutions, which will add to the excitement and energy of the experience. Enjoy a walking tour of the mythical birthplace of Apollo and Artemis. Today, Delos is a World Heritage site and is considered to be one of the most sacred islands in the Greek world, as central to Grecian spiritual life as Olympia and Delphi. Walk along the Sacred Way to the Sanctuary of Apollo, a spectacularly rich archaeological site with remains of three separate temples from the fifth and sixth centuries B.C. Delos’ awe-inspiring ruins also showcase an entire district of Hellenistic and Roman-era houses and the 5,500-seat theater (300 B.C. ), the site of choral competitions during the quadrennial Delian festival. See the magnificent Terrace of the Lions, where legendary statues carved from Náxian marble have guarded the island for nearly 2,600 years. The island of Rhodes has been one of the most prosperous and strategic strongholds in the eastern Mediterranean since the Neolithic period. Dock at the fortified wall of Rhodes Town, a World Heritage site, and step into this extraordinarily well-preserved medieval city, built over a great Hellenistic metropolis, and a major Christian outpost during the Crusades. Visit the splendid 14th-century Palace of the Grand Masters, built by the Knights of St. John and one of the only examples of Gothic architecture in all of Greece. Travel by coach to the ancient citadel of Mycenae, a World Heritage site. According to Homer’s epic, The Iliad, King Agamemnon led the Greek army to battle the Trojans in Sparta. Day 9 — Depart Athens for U.S.